We know that dying is a natural part of life but our mind lives in denial either thinking that we never will or blocking the thought out completely in the hopes we will avoid it altogether. Have you ever wondered, what it’s like for someone to find out they only have a short time to live? Would someone who’s dying be able to find inner peace? Would they learn how to forgive themselves and others for past misdeeds? And what would they have regrets about? That they hadn’t made more money, or that they hadn’t been famous? Or even that they hadn’t taken that last final trip across the globe to the exotic place they’d always dreamt about? Bronnie Ware, an Australian palliative nurse who counseled the dying in their last days, discovered there was no mention of that, or even bucket lists like scaling Mount Everest. But what she did reveal as the most common regret was “I wish I hadn’t worked so hard.” In other words, people wished they had stopped to enjoy life more with those they loved. 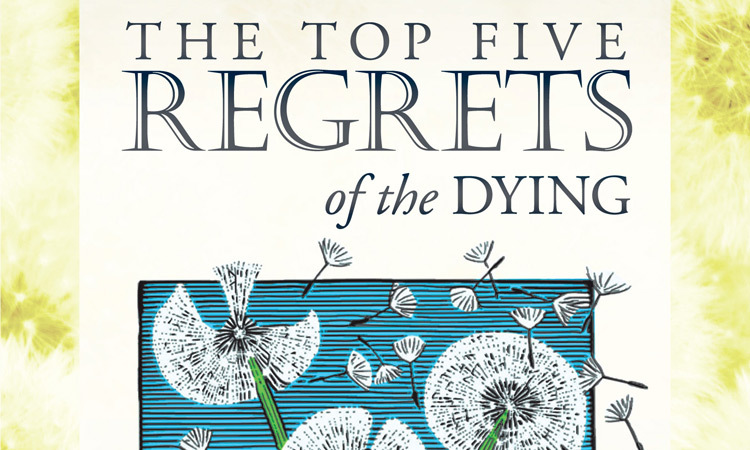 I just read Ware’s moving, bestselling book The Top Five Regrets of the Dying: A Life Transformed by the Dearly Departing. She recorded the dying’s last thoughts in her blog Inspiration and Chai. “For many years I worked in palliative care,” she says. “My patients were those who had gone home to die. Some incredibly special times were shared. I was with them for the last three to twelve weeks of their lives. These are regrets which I’m sure resonate with many of us, like they do me, even when we are not in our final stages. But not many of us want to think about mortality. Ware adds that rather than acknowledge the existence of death, “we try to hide it. It is as if we are trying to convince ourselves that ‘out of sight, out of mind’ really works. But it doesn’t, because we carry on trying to validate ourselves through our material life and associated fearful behavior instead. If we are able to face our own inevitable death with honest acceptance, before we have reached that time, then we shift our priorities well before it is too late. This gives us the opportunity to then put our energies into directions of true value. Once we acknowledge that limited time is remaining, although we don’t know if that is years, weeks or hours, we are less driven by ego or by what other people think of us. Instead, we are more driven by what our hearts truly want. This acknowledgment of our inevitable, approaching death, offers us the opportunity to find greater purpose and satisfaction in the time we have remaining.” And that is the gift that the dying give to the living.